Eng. 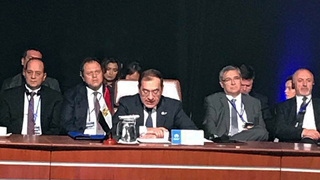 Tarek El Molla, Minister of Petroleum and Mineral Resources headed Egypt’s delegation in the Ministerial Meeting of the Gas Exporting Countries’ Forum (GECF) in presence of Oil and Energy Ministers of the 12 member and observing countries to discuss developments that the global gas markets witness. He also delivered Egypt’s Speech on behalf of President Abdel Fatah El Sisi before the 4th Gas Summit of the GECF, which followed the Ministerial Meeting, in presence of Evo Morales, President of Bolivia as well as Presidents of Venezuela and Equatorial Guinea, Heads of Governments and Ministers of the GECF member and observing countries. He assured that Energy is one of the key elements in achieving sustainability and its supplies are considered a main factor in boosting production as well as achieving stability and development, in addition to providing job opportunities and it works towards enhancing living standards and limiting poverty. He clarified that the “Johannesburg declaration on sustainable development” held in 2002 asserted the importance of taking joint measures that aims at enhancing the efforts of cooperation on all levels, in addition to facilitating access to reliable energy services with affordable prices for sustainability purposes and to contributing to achieving these Millennium development targets. It also asserted on energy conservation that coop with the development rates, especially with the growing energy demand and global oil and gas market fluctuations, is considered one of the challenges that all countries face, and that natural gas plays an important role in overcoming those challenges and in achieving the desired sustainability. He praised the Forum’s effective role in achieving natural gas resources sustainability, in addition to supporting and boosting joint interests of member countries through establishing suitable policies and strategies that aims at achieving utmost economic gains from those countries natural gas resources while maintaining the rights of future generations in those resources. He pointed out that the gas industry is touted as a unique industry that links all its activities connected in one loop with each activity depending on the other, and so it was important to work towards sound planning and integrated strategy that includes all those activities to achieve value-added. He also clarified that gas projects witness increasing costs with no clear future as to what gas prices will be like, which requires intensifying cooperation between our countries along with studying joint projects that achieves our countries’ and people’s interests. He added that this era is witnessing a revolution in telecommunications and tangled interests, and it is hard to live in isolation from the world countries or to work only for our producing and exporting countries interest without considering the needs of the consuming countries. So we have to boost cooperation and coordination between energy producing and consuming countries to achieve global markets stability. Moreover, He pointed out that Egypt is going through a pivotal era of its history, aspiring to create a modern state of social justice that transports Egyptian people into wider horizons of development and prosperity. Egypt already possess the natural and human resources that could enable it to achieve such desired ambitions. He also pointed out that the Egyptian economy faced many challenges in the past few years, notably those related to the importance of upstream investments attraction and accelerating new discoveries developing rates in order to increase production to suffice increasing energy demand – which exceeds population growth rates – and to contribute to achieving the country’s ambitious plans. To overcome such challenges, Egypt implemented an integrated economic reform program that aims at achieving a disciplined market economy and providing suitable job opportunities as well as decreasing unemployment and poverty rates and increasing development rates by more than 6% in the coming years. Such measures includes completely liberating the exchange rates, reforming energy subsidies and implementing value-added tax in addition to working towards attracting more investments through various procedures that include issuing of a unified investments’ law and delivering more incentives for developing local and foreign investments as well as expanding investments’ guarantees and industrial permits laws. Furthermore, the State sought to implement many major projects that have huge returns and large investment opportunities, especially the Suez Canal axis development projects and developing, establishing a number of industrial areas throughout Egypt and establishing the new Administrative Capital. Through those procedures and reforms, it was possible to change the economy’s path to achieve a growth rate of about 4.3% last July and raising the foreign currency reserves to more than $36 billion for the first time since 2011. In addition, Egypt’s strategy for the future by 2030 aims at making the Energy Sector capable of fulfilling national sustainable development demands of energy resources and maximizing utilizing various resources (conventional and unconventional) efficiently leading to effective contribution in boosting national economy, competitiveness, social justice and environmental preservation. A new Gas Market Activities Regulatory Law was issued, considered as one of the most signficant steps towards reregulating the gas market gradually and works on attracting the private sector investments to venture in the market of trading, storing, selling, importing and distributing Natural Gas directly to consumers. This law is considered one of the main pillars in Egypt’s strategy to transform into a regional hub for trading and exchanging energy, considering major natural gas discoveries achieved lately in the Mediterranean and Nile Delta, which will begin production soon as well as Egypt going ahead in the path of achieving self sufficiency of gas thus beginning exports. This comes from an integrated strategy that includes a group of procedures and reforms currently being implemented, to increase oil and gas production through intensifying upstream activities and linking new discoveries on the production map as well as raising current fields’ efficiency. Those efforts came into fruition through achieving a series of successes, notably discovering the Zohr gas field in the Mediterranean, considered one of the largest natural gas basins in the world, with estimated reserves of about 30 trillion cubic feet of natural gas. Egypt is currently preparing to begin production of the first phase of Zohr that will reach 2.7 billion cubic feet per day by the end of 2019, in the end of the project’s final production phase. At the end of his speech, He thanked the President of Bolivia for hosting the Summit and the Forum Secretariat on the efforts of preparing such an important event.